Turning 30: Not as bad as the cliches. Three months ago I turned 30. The age everyone dreads in the media. The age people have mini-mid-life crises. The age where you become old enough to be experienced, but young enough to still be considered young by working professionals. I’ve changed a lot over the last 15 years, as most people do. But one thing has been pretty constant… the steady weight gain. So I’ve been working hard for three months. My previous goal to control portion sizes and count calories has been working even better than I would have expected. I have a neck, my waist is more even to my hips and I’ve stopped snoring altogether (not that it was too bad before). I’m running and walking at least 4 miles a day, and everything I consume is a conscious decision. I’m still about 30 pounds from my goal weight, but I’m feeling great. I’ve also been working hard to pay down all of the debt I accrued living in Orange County while making almost no money at all. I’ve managed to get the credit cards down to zero this week, and my small student loan is just on the horizon and should be paid off soon. Turning 30, so far, has been all about hard work for me — and that hard work paying off. Eight more months to see what I can completely achieve before I’m past 30. It will be interesting to see what happens before then. As far as the cliches go, I don’t know if I will ever understand the great concern with aging. It is pretty inevitable and provides invaluable experience. Maybe turning 40 will be different. I’m so impressed, you look great and I’m so impressed that you’re killing off your debt. It’s a good feeling. Go you. Thanks 🙂 hopefully I will have a follow up in a few more months. I just want to let you know that after visiting your site, well, i’m in the exact same boat, and I bascially lost the same values doing the exact same thing. I always tought losing weight wa sa struggle, but even though it’s work, it’s one of the easiest thing i have ever done… Only i am 33, not 30. I had the worst lifestyle ever before: i was a smoker, and not a social one, i would smoke anywhere and everything, i was a heavy drinker, and i won’t even mention my eating habits… Urgh! 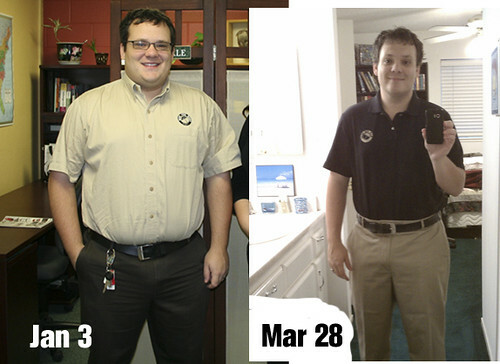 I shed 50 LBS in 3 months, just going to the gym everyday and doing some exercise, moving, and couting, like you. I was 265 Lbs, and my heart was suffering: i had high blood pressure, my cholesterol levels were high and i couldn’t freaking move! This is the past now, but like you, i am still working on myself, i wanna shed another 40 LBS, i want to go down to 175. If i keep the same weightloss rate, i should be there in another 3-4 months, maybe a bit more sinc ei have noticed lately my weightloss rate has diminished. I’ll be back till then, and hope to read more about your sucess in beating time and aging in a negative way, as i am doing it for the very same reason, for my future and my family, My dad had the same problems… Hey the same goes for my wife even, she has lost about 20 Lbs because of my new lifestyle. I feel my entire life has been comfort, without really knowing really what this feelings was. I’m glad to see people like you putting words to actions and doing what it takes to attain a goal… Congratulations, again!